There are 14 awards this time, including VRCORE Awards, Best Game Awards, Best Film Awards, Best Application Awards and other 10 Awards. The Best Audio Awards is set first time, to encourage developers pay attention to the voice in VR world. Another award set first time is the Best Multi-Players Content. The location base content and net-working content will be chosen by this award. 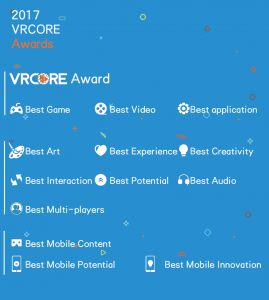 The competition has the three prizes for mobile/standalone VR this time, including Award of best mobile content, Award of best Potential mobile content and Award of best innovative mobile content. 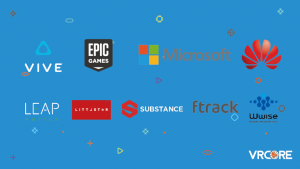 历史的文章历史的文章：Global VR Hackathon had the top 3 teams in the world.未来的文章未来的文章：Calling for Congregation！VRCORE Awards Complete Jury List Finally Get Released!